Travel is one of the best things you can do to take your mind off things. One of the key things to keep in mind when you’re traveling is staying in touch with your loved ones. We know what you’re thinking – “Can’t I just take the SIM card I have with me?”. Well, you can, but only if you don’t mind spending a bomb on roaming charges. Not to forget the fact that data isn’t free when you’re abroad, unless otherwise specified by your local carrier. Keeping this in mind, it always helps to venture out alternatives in order to save yourself from being ripped off by carriers. There are several ways to do this, but the easiest and perhaps the most convenient way to do this is by getting a international SIM card that is designed to work internationally before you make the trip. There are several providers out there who offer this service to traveling customers and we’ll talk about them later in this article. However, we will also discuss a few providers that you might not be aware of. The point here is to help you save as much money as possible while you make your trip overseas. So here are 11 best international SIM cards or providers that you can choose for your travels. Orange is one of the well known carriers in the UK and around Europe. The carrier has been in operation for quite some time and has quite the treat for customers traveling to Europe. Known as “Orange Holiday Europe”, this pack offers the best features especially if you want both data as well as calling when you’re in an European country. What’s even better is the fact that it works in practically any European country, so no matter where in Europe you’re headed, you’re almost certainly going to find coverage there. The carrier does this by pairing with regional carriers in Europe wherever Orange is unavailable. This is a short term SIM card, meaning it will only last 14 days. You get access to 2 hours of voice calls worldwide, 1000 text messages as well as 10GB of 4G LTE data wherever available. So for a trip that will last only a couple of weeks, a SIM card like this is ideally suited, and we even recommend you to get this to your family members or friends who are traveling with you. Coverage is available in 30 European countries, which includes the likes of Spain, Portugal, the UK, as well as Crete. While most competing SIM card providers offer similar calling and text perks, the 10GB of high speed data is what really makes this offering stand out from the crowd. The fact that you’re pairing with one of the leading carriers of Europe is also pretty reassuring as a customer. 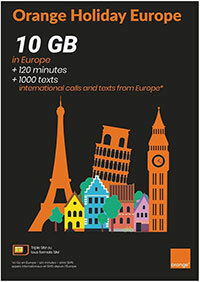 The Orange Holiday Europe SIM card package is available for $49.99 and ships immediately to your U.S. address. This offering is designed to keep you going even through your travels. This is a truly international SIM card, offering support in 125+ countries around the world. So this should cover even the tiniest and remote country you’re planning to visit, although there are some countries that miss out here due to network restrictions. One benefit to using this offering is that it offers free usage of WhatsApp wherever the carrier offers internet services. The rest can be enjoyed in 4G LTE or 3G wherever applicable. Bear in mind that this is only a SIM card, and although it comes with $10 free credit to use, you will have to top up at least $25 to be able to save money. The aforementioned WhatsApp feature will not work until you have topped up your account balance. Luckily, the folks at KnowRoaming offer free apps on the Google Play Store and the iTunes App Store for your Android smartphone and iPhone respectively, allowing you to buy credit on your number, view usage, change plans and do a whole lot more without ever heading to a store. Customers who bought the product vouch for its accuracy and data speeds, so you’re in very good hands here. KnowRoaming might not be a popular name in the SIM business, but it still gets the job done in exceeding colors. This SIM card is priced under $20, but we’re not sure for how long, so be sure to have a look. This is yet another chat focused travel SIM that can come in handy to the customers traveling internationally. By default, it provides 15MB worth of free data every day for a period of 12 months. While this in no way is sufficient to load images and videos that you receive on IM apps, it’s sufficient enough to have several conversations with your friends and family around the world. Naturally, you can also choose to purchase data or add a calling pack as you see fit. The standard rates for calls are $0.25 per minute, while incoming calls are free. Data will be charged at $0.25/MB, which is slightly expensive, but the SIM provider offers $10 credit with each SIM, so you’re not required to top up any further, unless you absolutely need to. The provider mentions that the SIM card works fine in countries like Europe, Italy, France, Brazil, China and 75 others, so you’re going to find this very handy if you’re traveling internationally. The listing, however, mentions that this SIM will not work in Saudi Arabia. This simple yet effective travel SIM is priced under $25 on Amazon at the time of this writing. This is a truly global SIM card as it works in over 200 countries, including the U.S. This means the WorldTravel SIM card could be the only card you need to get if you’re ever planning to travel beyond Europe and Asia. But as is the case with most international SIM cards, there are no plans or packages to pick from. What you get here is a SIM card and that’s it. It also comes with $10 credit that you can use for calls or data usage, which will then need to be topped up as soon as you run out. We recommend getting this SIM only as a backup option if your primary SIM card doesn’t work or has no access to network in the area that you’re in. Customers speak highly of this product and mention that it works just fine no matter where they went. However, if you’re in a region where there’s no network connectivity at all, it’s impossible for the SIM to catch bars, as it relies on the local network of the land to provide connectivity to the user. Makers of the WorldTravel SIM card promise that you can save up to 90% on carrier overages and roaming charges with this product. Does that strike your fancy? Have a look at Amazon. Keepgo has always been a reliable solution when you’re traveling overseas primarily because of their easy to use packages as well as the network they provide internationally. The makers mention that it offers mobile data coverage in 105 international destinations, which is a promise that not a lot of carriers can make to be honest. This SIM card is termed lifetime because it has no expiration date, in theory. However, if you keep it unused for more than a year, services will be terminated automatically. To start things off, customers get access to 1GB of data which can be used as frequently as you want. When you finish that data, all you have to do is top it up directly from Keepgo. Once you top up your data balance, validity is extended to another year. The packaging of Keepgo deserves a special mention as well since it comes with all the tools and help you will require to install it on your smartphone. So regardless of what phone you use, Keepgo SIM cards will just work on your device. Android users simply have to slide the SIM into their smartphone or tablet and change the APN settings. If you’re unaware about how to do this, the Keepgo packaging will contain all the information to help you through it. Lastly, if you ever have a problem with the SIM or its performance, the Keepgo team will be happy to help you out 24/7. Priced at under $50 right now, this is not particularly an affordable option now, however. But I guess for a SIM card that can potentially last forever, this is a small price to pay. This might be a name that you’re not particularly familiar with, and that’s understandable. However, the SIM card offered here is packed with features for travelers who frequent foreign destinations. This SIM offers a dedicated +44 number to each user while you can also add a +1 U.S. number to keep in touch with your friends and family. The company mentions that this particular offering works in over 190 destinations worldwide. The user has $20 of airtime credit to use with this SIM, and there are no free calls, texts or data involved. This means every call you make or text you send or data you download will be deducted from the $20 credit offered with the SIM. It is advised to get a dedicated data pack to avoid paying too much for data. Costs can come down to up to $0.02/MB with a dedicated data plan activated. Calls and texts, on the other hand are charged at $0.35 each. But luckily, there are no hidden charges or shady activation fees, so what you see is what you get. The company mentions that it has teamed up with over 440 carriers worldwide which should give you enough coverage no matter where you’re headed. In fact, the team has also worked to provide free data in over 150 cruise ships around the world. Recharging or topping up your credit can be done conveniently using your phone, computer or a travel app while it’s also possible to enable auto renewal with a credit card. Priced at a touch under $30, this is definitely a good bargain if you want a truly global SIM card that can stand the test of time. This is yet another convenient global SIM card that has coverage in 200 countries and counting as of now. This means you can call, text or use data in most of these countries without breaking a sweat. This is the best way to avoid being fleeced by your local carrier, with data costs for roaming going well beyond affordability. OneSimCard also offers a 5GB data plan for this particular SIM, but it will set you back by $29.95. Bear in mind that this is only applicable in a few countries of the world. There’s also a credit of $10 included with each SIM, so you’re good to go as soon as you install it. Data costs are pretty low at $0.02/MB, while outgoing texts will cost you $0.10 per text. Wi-Fi and mobile data calling is available for as low as $0.01 per minute, which is an ideal option if your contacts back home are on data based calling apps. Incoming texts are free, however. With this SIM, you get an American and a UK number, so you have the liberty to call your home contacts with the local number. It even has a SIM VoIP app that lets you make traditional phone calls using mobile internet, which is how the aforementioned cellular calling feature works on this SIM. In addition to paying for data from your credit, you can also get designated packs like the one mentioned above. The cheapest option available is $19 for 1GB of data which can last a while depending on your usage. While traveling overseas, it is always recommended to use a Wi-Fi network whenever possible. OneSimCard is one of the expensive offerings out there with a price tag of under $40. But reviews on Amazon suggest this is a good SIM to own, so we recommend it. This is a no frills SIM card that can help you stay in touch with your family and loved ones when you’re away. It comes with $26 worth of free credit, which is pretty spectacular considering that the entire package costs well under $30 as of now. It works in more than 200 countries letting you use it for calls, texts or data. The onboard credit helps you get started, while there are packs that can help you save up on the costs as well. This is a SIM that fits all unlocked GSM smartphones, including those that use nano SIM cards. There are adapters included as well, so you get to choose what SIM card you want with this. There is no elaborate activation process either. You simply have to plug it into your phone and you’re good to go. You will, however, need to activate this offering in the U.S. before you can start using it. So if you’re traveling anytime soon, we recommend getting this right away so that you can activate it and be on your way. Data is priced at $0.05 per MB which is pretty decent while on roaming. Domestic calling to the U.S. is pretty cheap as well, while international calling can get a little expensive. But since the company provides $26 of credit with this SIM, you will not be needed to top up if you’re heading on a short trip. 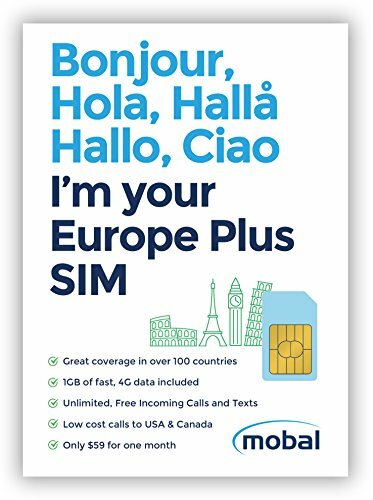 This is an excellent SIM card to own if you’re traveling to Asian countries (excluding Thailand) and is a data only offering, meaning there’s no calling or texting facility available here. This means you’re better off using this on a spare phone just for data or on a dedicated mobile hotspot device. It lasts for 15 days with the provider not mentioning any data limits, so you’re probably going to get a ton of high-speed data with this offering. If you’re traveling to Thailand, you will need to get a top up as this is a local SIM card in Thailand and roaming won’t apply here. But barring this, traveling practically anywhere else in the world should be no problem with this AIS offering. Customer reviews for the product are pretty great as well, so you’re definitely getting your money’s worth here. It is currently priced under $40, but knowing the nature of this business, it’s hard to tell how long this pricing will stick. As far as truly global SIM cards go, though, it’s tough to beat this offering by AIS. This is a pretty versatile offering and something for the users traveling to the Asia Pacific region. In addition to the expected countries, it also supports Australia and New Zealand, so if you’re traveling to either of these countries, this SIM makes complete sense. It offers 3GB of high speed internet data which will be throttled to 128Kbps after the limit is reached. This means it is a truly unlimited data offering and there is no chance of being overcharged for data. Sure, data will be slow, but it’s any day better than getting ripped off by the carrier. So in total, this SIM card works in China, Hong Kong, Macao, Taiwan, Singapore, Malaysia, Japan, Korea, Thailand, Australia, New Zealand, and of course, the United States. The company mentions that this SIM card doesn’t support hotspot devices, so you’re better off using this on your personal smartphone. Since this is a data only SIM, there’s no notion of credits here. You simply buy the SIM and use the data for a period of 15 days, following which you will need a new SIM card. It is priced under $30 which is pretty attractive for an offering like this. This is not particularly a SIM card, but a lot more than that. GlocalMe has been instrumental in encouraging users to switch to hotspot devices instead of bulking up data on their phone and using it as a hotspot, which can take a beating on the phone’s battery. While the price tag might scare you for a bit, you have to realize that this is a portable hotspot device and not just a SIM. While it comes with GlocalMe’s data by default (1GB), you also have the option to add more data if you need it. Further, the device comes with SIM slots, allowing you to use it as a standard portable hotspot device. This uses the company’s Cloud SIM tech, which means that it can provide data services to you while traveling, even if it doesn’t have a SIM card. This makes GlocalMe’s offering a hot favorite for anyone traveling overseas. The G3 can work in over 100 countries and offer you data without incurring any roaming fees or charges as it is offered directly by the company. You can also choose to get the company’s Daypass which will give you enough data for a full day’s usage. This can run you for as low as $1.5, making it an incredibly attractive option for travelers. Naturally, you can also use your international SIM card on this device if you don’t want to use GlocalMe’s data while traveling. But in that case, be sure to check with the carrier about data costs and other charges that you might incur. The G3 uses high end security protocols to keep the Wi-Fi connection safe, so you can be absolutely certain that nobody is stealing your data while you’re on the go. Also, since this device has a proper display, you can check the number of connections and the amount of data you’ve used over a period of time. The GlocalMe G3 is available for under $170 and is a valuable purchase for any customer. You can get this product in Black or Gold variants.